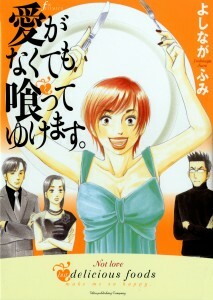 Perhaps some kind publisher will announce the licensing of Yoshinaga’s What Did You Eat Yesterday? It’s a Kodansha title, and they’ve been rather tight-fisted with their properties of late (or at least since they announced their direct entry into the market, which is either ironic or perverse, depending on your point of view). Of course, we can all at least look forward to the November release of Not Love But Delicious Food from Yen Press. And, awkward Fakespearean adaptation aside, we can continue to enjoy Yoshinaga’s award-winning Ôoku: The Inner Chambers from Viz’s Signature imprint. The fourth volume will arrive in August. This entry was posted on Monday, July 19th, 2010 at 2:18 pm and is filed under Linkblogging. You can follow any responses to this entry through the RSS 2.0 feed. Both comments and pings are currently closed. Any clue how to get volume 4 of Flower of Life? Only used copies seem to be available — at more than $50 up.